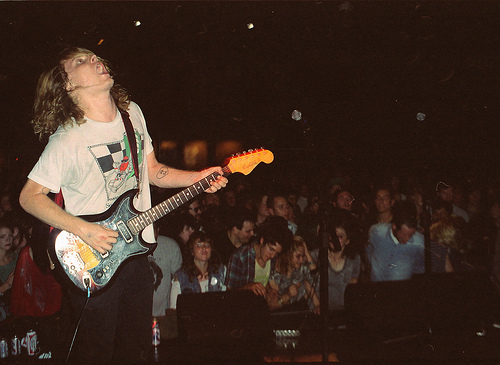 Today’s been dragging pretty hard but we’re about to pick your day up with a brand new Ty Segall video. It’s for the track “Where Your Head Goes” from Goodbye Bread [Drag City] and it’s pretty gnarly. Lots of green screeny fuzzy TV vibes going on. There’s a nice little interview to follow-up the video at the Transworld Snowboarding site. Check it out here. We recently ran across another interview with Ty where he rattled off a bunch of upcoming releases he’s got lined up for the 2012 year [collab record with Tim Presley of White Fence, a full-band in studio record, new EP, blah blah blah] We just lined up Ty’s next visit to town but we’ll talk about that a little later. We guarantee it’ll be a party though. If you haven’t picked up Goodbye Bread — do so here. You can also pick up the recently released 2xLP singles compilation from Goner.